A shared business model for building fiber networks instead of a vertical model has often resulted in higher utilization levels and faster roll-out plans and in the same time enable a larger customer base for the service provider. But what kind of requirements does such a shared business model, often called open access or wholesale, imply for the interoperability between a network operator and a service provider? What distinguish an efficient and flawless way of working together? Netadmin has approximately equal proportion of customers with vertical and open access business models. Netadmin is neutral to the choice of business model. In this blog series, we’ll describe our experiences of open access and it is written from both a network operator and service provider perspective. We dare to make a statement that if you haven’t addressed the bullets above you are getting serious problems in your organization and towards your customers. It will result in high operational expenses, problems with keep growing and trustworthiness problems in the market. These problems can efficiently be addressed with purpose-built software. Have you addressed these processes in your organization? Shall customer information be shared? Who creates the order at the network operator? Via the service provider or directly in a subscriber self-service portal? How is billing done? Service provider to subscriber or partly via network operator to subscriber? How does the service providers get knowledge about the available addresses with fiber? How are the roll-out plans announced? How does the service interconnect points look like? How shall the network configuration look like? To whom shall the customer file an error report? How shall an error be detected to understand where the problem is located? All these questions are important to think through for each market. We have, regardless the answers, listed a couple of important factors for successful cooperation. Please note that the cooperation requires work both from the service provider and network operator. The importance of a network operator to provide service provider insight in their network for quality check, support, feasibility and availability checks and market access to name a few. 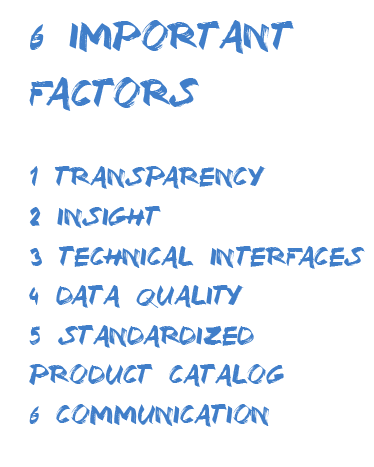 It is important to have a high data quality to avoid stops and hassles in the business processes. A typical data type that needs attention is address data. Service providers and network operators shall have a common understanding on a standard product catalog with services of different speed and priority, e.g. best effort and premium. This will then create a common understanding on what you are selling to the market. It is important to think of strategic, tactical and operative ways of communication. It is important that nothing gets lost in the communication and that you have clear channels for communication. By defining the cooperation with the service provider, you have a better chance to create a business model that is effective for all parties. By having an open network and a clear idea about the interoperability you are able to attract all kinds of service providers to your network and therefore giving your customers more options to choose from. In the upcoming blog post, we’ll talk about the effects an open access network will give to you as a network operator.